You didn't see that big fireball in December? Neither did astronomers. It was only the third biggest bolide to enter Earth’s atmosphere on record, so astronomers can be forgiven for missing it at the time. Now, after sifting through data obtained from monitors meant to detect illicit nuclear detonations, a Canadian scientist has determined that a meteor approximately 10-14 meters (33-46 feet) in diameter streaking over Kamchatka, Siberia on the 18th of December 2018 at about 11:48 AM local time exploded over the Bering Sea with the energy of about 173 kilotons of TNT. And it turns out we also have pictures. Because the object approached Earth from the sunward side, ground-based telescopes didn't see it coming -- and wouldn't have spotted it even if it had been much larger. Months later Peter Brown, professor of astronomy and physics at Western University in Ontario, was examining low-frequency sound data collected by a world-wide network of infrasound monitors deployed by the Comprehensive Test-Ban-Treaty Organization, an international body that verifies compliance with the ban on nuclear tests. The data showed an unusually large explosion had occurred over the Bering Sea in December. The CTBTO hadn't announced it because they'd quickly determined it wasn't nuclear. To be fair, NASA's Planetary Defense Officer Lindley Johnson (that is his real title) was informed about the fireball a few weeks ago by the US military. But even he was late in hearing about it. Because of its sensitive location, relatively close to both Russia and North Korea, information about the explosion was slow to come out until it had been determined to be a natural occurrence. 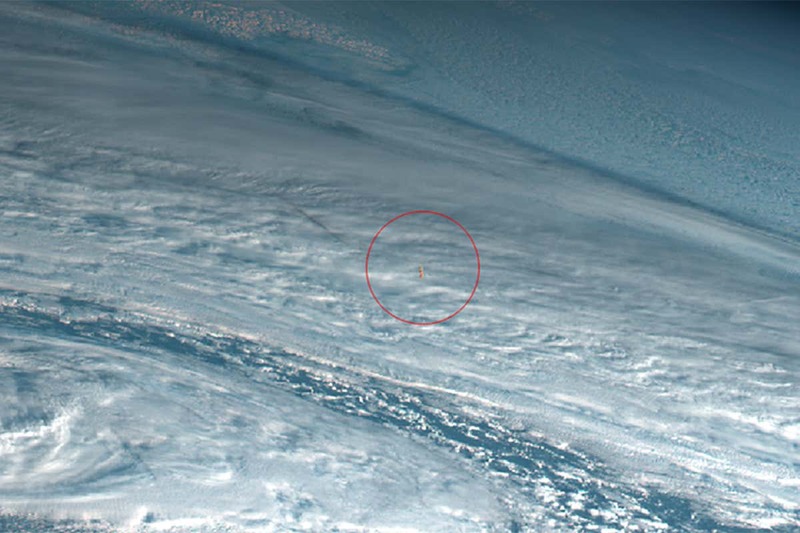 After Professor Brown publicized his findings, researchers were able to go back and look for satellite images that may have captured the event. It turned out Himawari 8, a Japanese weather satellite, had the goods, capturing images of a smoke trail and the track of the fireball. Now that the airburst has been verified, it's been listed in official databases of fireball events and entered into the record books as the the largest in history behind the Tunguska event of 1908 and the Chelyabinsk meteor of 2013 [previously on Metafilter]. Given the number of such objects in our solar system, airbursts of the magnitude of the Bering Sea event can be expected roughly once per decade. It's only recently that we have the means to detect them when they occur over such unpopulated regions. The fact that an explosion eight times as energetic as that of the most devastating bomb ever deployed in wartime barely registers on those satellite images really puts the scale of our planetary home into perspective. So what kind of snacks does one bring to a superbolide party? We actually have the technology to properly watch for these kinds of objects, but doing it in practice is a bit of a logistical nightmare. A constellation of hundreds of cheap, tiny cubesats in orbit armed with commercial IR/Visual sensors could stare continuously at the entire sky to spot the occasional glint of light or the telltale wink of a star as a rock floats past, and it would be reasonably cheap to make. The problem is the unsexy parts of the operation, the vast amount of video data that fleet of satellites would create, possibly dwarfing everything else in orbit. It can't use conventional video compression like Youtube because the image artefacts those techniques introduce would hide the tiny signal of a faint asteroid. And then you have the small issue of simultaneously processing hundreds of real time video feeds, with low enough latency to give people a half-hour warning to hide in their basement and away from any windows. Oh, and who's going to pay for it? So yeah, we're probably waiting until one of these bolts from the blue eventually hits a populated area, and it's kind of frustrating. The technology problems are probably solvable with enough funding, but no-one is likely to be interested in lumps of rock millions of kilometers away until they literally fall on their heads. Minor point of order: It's second largest if you go by NASA's list, which starts in 1988 or fourth/fifth if you include the much patchier records for the rest of the 20th Century. Besides Tunguska and Chelyabinsk, there was a 190kt bolide over Spain December 8th, 1932 and one in the extreme southern Indian Ocean of 170-350kt August 3rd, 1963. Which only emphasizes the point that these things are not rare and so correspondingly more dangerous. One every 30-40 years should be expected, probably more now that we're really looking for them. I do wonder how many times one went off over some populated area in Antiquity. There's a suspicion of one over Gansu Province in China in 1490. Why do all the big ones head for Russia? It just seems...weird. No military, fishing or shipping vessels in the area? There’s a whole bunch of there there. I was thinking that too, but there probably aren't a ton of shipping vessels in that part of the ocean, fishing vessels (save for the Deadliest Catch, who may or may not still be filming up there) probably don't have much in the way of cameras on board, and any military units in the area probably aren't inclined to share footage if they have it. Also, looks from those images like there was a big storm in the area, so visibility was probably bad anyway. The Bering Sea and Siberia are remarkably remote. This is very cool and I'm sad that it's probably going to go unnoticed by mainstream news because of everything terrible in the world. Those satellite images look so much like BSG CGI and I love it. The GPS constellation (Navstar) does this; in addition to providing navigation services, each GPS satellite also has a nuclear detonation sensor. They're called, humorously, bhangmeters. They're designed to look for a very distinct double-flash produced by atmospheric nuclear detonations. My guess is there are other sensors designed to look for exoatmospheric detonations as well, although there's not a lot of information published on their exact capabilities (imagine that). The predecessor system, Vela, had a variety of sensors and gets credited with (accidentally) observing the first gamma-ray burst. They are also the subject of an intriguing conspiracy theory, if you're into such things. Russia is really really big. This is awesome. I'm going to get hold of this Peter Brown person and make him tell me everything. Don't you all have an HSN-1000 in your parts bin somewhere? I wonder how many city destroying sized impacts have occurred in the southern ocean and emptier stretches of the pacific? Well, something took out Lemuria. The delay in informing Planetary Defense Officer Lindley Johnson is... disturbing. Also, a good kernel for a story. I always thought of him more as a musician, than an astronomer. From the datasheet: "Maxwell Technologies’ liability shall be limited to replacement of defective parts." Good luck claiming the free replacement if it doesn't work right when it's needed. As a professional astronomer, it is humbling and terrifying how little of the sky we observe at any given time. On the optical side, the LSST will eventually cover a good chunk of sky every night - but only the night side. For a lot of science, that's fine, but when we're talking about identifying extreme (city-killing) hazards, it seems so ... inadequate? Radio astronomers don't even have daylight as an excuse, but we are tremendously limited by technology and computation resources - for example, identifying where a "fast radio burst" was coming from required imaging a ~1/4 square degree patch of the sky with high angular resolution at 200 frames per second for about 90 hours in total - and we acquired 90 Terabytes of data. The archive managers were really not thrilled about that. For comparison, there are 40,000 square degrees in the sky. seanmpuckett: That's a feature of all spherical polar coordinate systems. Area in spherical coordinates isn't as simple as in Cartesian; as you correctly intuited, a "square degree" isn't really a geometric square. A decade ago I saw a fireball while I was out walking my dog. It was about half an hour before sunset. Even in the daylight it was the brightest one I've ever seen and it had a greenish tint. It lasted for about a second and then broke into three pieces before disappearing. It was an amazing thing to witness.